Although 64 different Quran verses instruct Muslims to follow the path of "modesty," Turkish Religious Affairs Directorate President Mehmet Görmez has other ideas. Turkish President Recep Tayyip Erdoğan argues that the American continent was discovered by Muslim sailors some 300 years before Christopher Columbus – and that Muslims had even built a mosque atop a hill near the Cuban shore. Science and Technology (Science!) Minister Fikri Işık claims that Muslim scientists working around 1,200 years ago (some 700-800 years before Galileo Galilei) were the first to determine that the Earth is a sphere. These are all controversial theories. 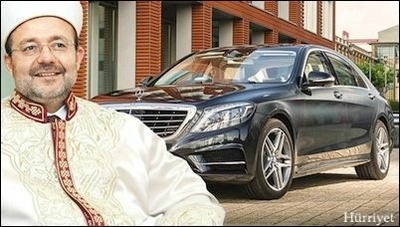 But the luxury car Mercedes is discovered by Muslims every day, most recently by the top Turkish clergy. Professor Mehmet Görmez, the president of the Religious Affairs Directorate (Diyanet), is the inventor of the theory that Christians should celebrate when Muslims (Ottomans) capture Christian lands, as this is a merry event and they are lucky because their hearts and minds will be "conquered" by Islam. All the same, when non-Muslims take back the lands they lost to Muslims this amounts to the sinful act of "occupation." According to this theory, Professor Görmez should be feeling sorry for the Viennese, because in 1683 they lost the chance of pure happiness of having their minds and hearts conquered. It's never too late; the Viennese are smart people. But apparently, 2014 is no good time for the Muslim conquest of Christian lands by the force of the sword; but luckily sophisticated methods exist in the times of Turkish science. Professor Görmez may have given up on Vienna, but he sure knows how to conquer and win hearts and minds in Bavaria – where the Germans build Mercedes cars for the world's richest. A couple of weeks ago, Hürriyet ran a story that claimed a foundation run by Diyanet had decided to purchase a top class Merdeces S500, with a nice price tag of $400,000, to drive around Professor Görmez. Diyanet vehemently denied this absurd claim. No, it said, the money was not paid from the foundation's money but was paid from Diyanet's own budget; and the price was "lower." Curiously, Diyanet was too shy to disclose "how much lower." Hürriyet's bad reporting had been unmasked. The money came from Diyanet's budget, not from a foundation it runs. So, the story was merely "slander." Diyanet's 2015 budget is 1.4 times bigger than that of the Interior Ministry, 2.7 times bigger than that of the Foreign Ministry, [and] 5.1 times bigger than that of the National Intelligence Agency. Worse, Hürriyet's slander had been so smartly timed that the story ran on the page only a few days after news reports said Pope Francis, during his visit to Turkey, had insisted to be driven in a $20,000 Renault Clio. Diyanet thinks that the two stories combined were put on the page in order to "manipulate public perceptions." What Diyanet's long denial statement did not say was that "a Mercedes S500 for Professor Görmez was not, is not being or would ever be purchased from whatsoever fund or source." If, Professor Görmez must have reasoned, the president of the country deserves to spend nearly $800 million on his new presidential palace and private jet, this modest administrative leader of Turkey's more than 70 million Muslims should deserve a chauffeur-driven S500 which even comes at a price "lower than $400,000." He could have applied an alternative logic to justify the fancy S500. Diyanet's 2015 budget is 1.4 times bigger than that of the Interior Ministry; 2.7 times bigger than that of the Foreign Ministry; 5.1 times bigger than that of the National Intelligence Agency (MİT); 6.1 percent bigger than that of the Prime Ministry (to which it reports); 12.1 percent bigger than that of the Health Ministry; 19.7 percent bigger than that of the EU Ministry (most understandable of all); and 35.4 percent bigger than that of the Court of Appeals. Since all of those ministers, the head of the MİT, and the president of the Supreme Court are being driven in cars equally fancy as an S500, why should Turkey's top Muslim cleric not go for one too? Right? Right. Unless, of course, Professor Görmez was the administrative (if not spiritual) leader of more than 70 million national adherents of a religion whose holy book instructs its worshippers - in 64 different verses - to follow the path of "modesty."